What if there was a drug that allowed humans to never need to sleep, and what if that drug had never been properly tested? To make matters worse, what if the guy who created the drug was your dad? 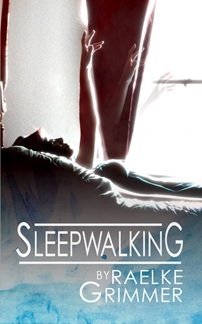 Sleepwalking is the debut young adult novel by one of Lip‘s favourite writers and book reviewers Raelke Grimmer. I chatted with Grimmer about YA as a genre, the writing process and her unorthodox path to publishing. Firstly, congratulations on publishing your first book! Had did the idea for Sleepwalking come about? I imagine there was a lot of research involved. Thanks! Since studying sleep as part of Psychology in high school, I’ve been fascinated by what sleep is, why we dream and why we sleep at all. There are theories, but no one really knows why we sleep. The idea for Sleepwalking evolved out of this, and the fact that when I look around today, there are so many people trying to cheat sleep, trying to survive on as few hours of sleep per night as possible, just to fit more hours into the day and cram more and more into their busy lives. So what if there came a point where science could spike the water supply and no one had to sleep anymore? What if people have 24 waking hours in a day? From here, the novel began to take shape. There was some research involved, but I drew on my knowledge of sleep from high school Psychology and researched where there were gaps in what I knew. How did you go about finding a publisher—was this a lengthy process? My first draft of Sleepwalking was written during NaNoWriMo in 2011. A few months later I found an opportunity in Writing Magazine—a UK publication—for an independent US publisher (BigWorldNetwork.com) looking for stories which could be published as serial fiction online in weekly installments. I thought this format would suit Sleepwalking perfectly, and spent some time rewriting and re-editing to fit the format. I submitted, and received an offer of publication. It initially ran online for 3 seasons of 12 episodes each, published weekly, and at the end of its digital run I was offered a publishing contract for it to be published as a novel in paperback. It took two years from writing Sleepwalking for the paperback to be published, but actually finding a publisher wasn’t a lengthy process. I was lucky in that I found an opportunity which looked like a perfect fit for my manuscript, and I was willing to try a non-traditional route to publication. What draws you towards young adult fiction? There is so much possibility within YA. Teenagers want to barrel headfirst towards adulthood while at the same time aren’t quite ready to leave childhood. Young adult novels deal with serious issues better than many adult novels I’ve read. I honestly believe young adults have some of the most fascinating and insightful outlooks on life. This makes it a challenging and very fulfilling genre to write in, as the possibilities really are endless, in my opinion, more so than in adult fiction. Young adult is also a genre for pre-teens up. It is a genre which almost everyone can enjoy, and it is still my favourite genre to read as well as write. I don’t think I’ll ever outgrow it. Who are the authors that have influenced your own writing? I’m a big fan of Matthew Reilly. The pace of his books makes them impossible to put down. This is something I try to achieve in my own writing and Reilly does it better than any other writer I’ve read. Melina Marchetta is another writer I have so much admiration for. My year 7 teacher read our class Saving Francesca when I was twelve and I’ve lost count of how many times I’ve read it since. Her writing is so raw and so real, and, while I always wanted to be a writer, it was Melina Marchetta who made me want to write young adult fiction. Jaclyn Moriarty and Julia Lawrinson confirmed my choice of genre. And Markus Zusak’s The Book Thief is one of the most remarkable books I’ve ever read—that book opened my eyes to the extraordinary possibilities and power of working with fiction, with words and with language. What advice do you have for other writers working on their first book? Finish it. Keep writing until you’ve finished, even if you think you’re writing rubbish, because finishing is half the battle. It can always be edited later. And once you’ve edited and rewritten once, or twice, or thrice, and you’re starting to shop around for a publisher, keep an open mind and your eyes and ears open for an opportunity. A traditional path to publication is now only one of many different ways to a publishing deal. Raelke Grimmer is a writer and linguist from Adelaide, Australia. She has published a children’s picture book, What in the World?, and a young adult science fiction novel Sleepwalking. She writes book reviews for Lip, and collects books written in foreign languages. I’d love to have a copy of ‘Sleepwalking’ in my bookshelf. I’m graduating primary school teacher, currently placed in a grade 6 classroom, and I’m constantly on the hunt for well-written YA novels to recommend to keen young readers. Engaging YA fiction which explores thought-provoking ethical issues is a great adjunct to critical thinking & media literacy learning tasks in the classroom. I’m also signed up to the Australian Women Writers Challenge for 2014 and planning to review a number of YA novels – ‘Sleepwalking’ sounds like a great place to start! This entry was posted in Books and tagged nanowrimo, novel writing, publishing, sleepwalking, Young Adult Fiction. Bookmark the permalink.